Thomas Bodley was born on this day in 1545. While his is not a name that jumps out at most people, including many scholars, his library is arguably the greatest contribution to the conservation of Western culture in England. I still remember my first visit to the Bodleian Library in Oxford. Walking between the magnificent shelves in the Duke Humphreys reading room. Sitting, and waiting, (for my books) in the well-worn desks in the lower reading room. Listening to the babel of echoed whispers cascading around the Radcliffe Camera. All the while enjoying the smell of paper and wood, with its unforgettable olefactory residue. This is a library to get lost in. Metal shelves and pragmatic decor fail to convey the same sense of space and purpose. Today, students make the most of the Bodleian’s endless collections and vast resources, and visitors marvel at its architecture and inspiring interior. However, its visionary founder, and namesake, Thomas Bodley has rarely garnered much attention. Even in his home town of Exeter, where I studied for several years, little remains to memorialize one of the city’s greatest sons, and no major biography in the last century celebrates Bodley’s achievements. Most of Bodley’s career, as a diplomat for Queen Elizabeth, reflects his legacy as an anonymous figure. While he was successful and had ambitions for high office, nothing ever came of it, and he was one of many royal officials that floated in and out of the courts of Europe. Then, in the 1590s, having retired from the diplomatic service, he became determined to revive the university library at Oxford. He writes in his autobiography, “I concluded at last to set up my Staff at the Library door in Oxford; being thoroughly persuaded, that in my solitude and surcease from Commonwealth affiars, I could not busy myself to better purpose, than by reducing that place (which then in every part lay ruined and waste) to the public use of Students.” In the final years of Elizabeth’s reign, he poured all of his energies into building up book donations (from private libraries), financial resources, and architectural plans for the refurbishment. Bodley made the most of his political contacts, garnering the support of some of the most important book collectors and antiquarians in England, including William Camden, Sir Robert Cotton, and Thomas James (who became the first keeper). Among his wealthy patrons, Bodley could include King James I, who knighted Bodley in 1604, granted perpetual land rights to the library, and named the library after this otherwise anonymous diplomat. The library was inaugurated in 1602 with 2,000 volumes and with a mission to collect and preserve as much of the world’s learning as possible. 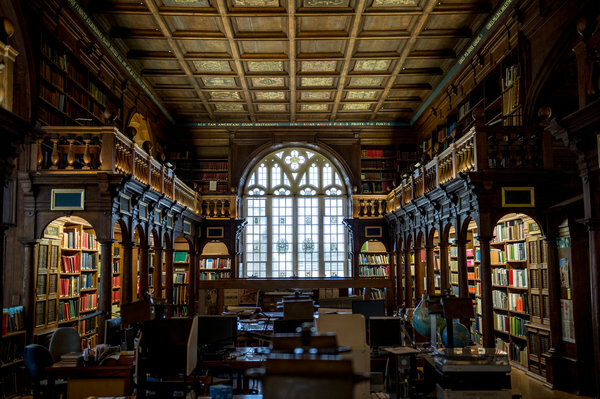 To this end, Bodley spent the rest of his life building the financial endowment of the library and recovering books and manuscripts that had been scattered and lost from public view after the Dissolution of the Monasteries. The collection ranged from a 9th century manuscript of Euclid and the earliest printed Bibles to the most important manuscripts of medieval science in England. From these more-than-humble beginnings, today, the Bodleian houses over 11 million printed volumes and thousands of manuscripts from across the world, and it continues to be one of the most renowned and beautiful libraries in the world. The Bodleian’s digitized Special Collections can be seen/read here. « All Trails Lead To…Houston!